NATBOARD DNB Final Exam (Broad Specialty) 2019 - The Diplomate of National Board (DNB) invites application form eligible candidates for Final Examination (Broad Specialty) during the admission session June 2019. National Board of Examination (NBE) has released notification for eligible candidates for admission into various Broad and Super Specialities for the academic year 2019-20 for June Session. The Application Form for various Courses of Broad/Super Specialities has been started. Eligible candidates can check the complete information of DNB Final Exam June like application process, eligibility criteria, exam pattern, and selection process through the page below. 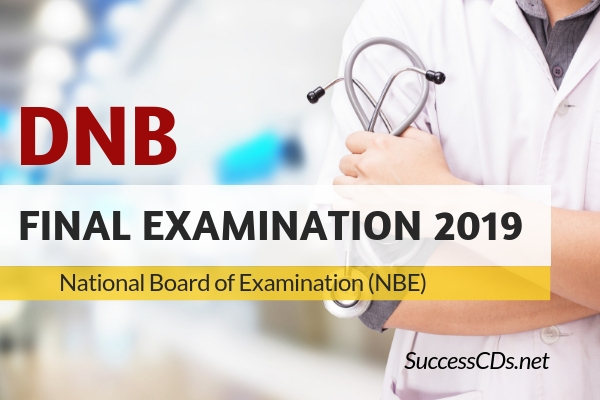 NBE at present conducts Postgraduate & Postdoctoral Exams in approved specialties leading to the award of DNB. The MCI has laid down standards for P.G. Exams conducted by various Medical Colleges & affiliated to concerned Universities and Other institutions, yet the levels of proficiency and standards of evaluation vary considerably in these institutions. The Exams conducted by NBE provide a common standard and mechanism of evaluation of minimum level of attainment of the knowledge and competencies of medical specialties. Submission of Training Completion Certificate along with leave records for DNB trainees is an essential prerequisite. In case the candidate does not submit the training Completion certificate (as per applicable format given in Annexure III & IV) with the application form, his/her application may be rejected, and fees forfeited. Candidates who have passed the final exam leading to the award of Post Graduate Degree from Indian Universities which are duly recognized as per provisions of Indian Medical Council Act 1956 i.e. have passed the final exams for MD/MS degrees on or before 30th April 2019 can apply for the DNB Final exam in same broad specialty. Candidates who are registered with the Board and completing their prescribed training (as per the registration letter) by 30th November 2019 are eligible to appear in DNB Final Exam. Submission of Training Completion Certificate along with leave records for DNB trainees is an essential prerequisite. Candidates not completing their DNB training at the time of submitting the application are required to submit provisional training completion certificate as per format in Annexure-III along with leave records and also required to submit Annexure-IV within 15 days of completion of their training. Such candidates shall be provisionally allowed to appear for DNB Exam at sole discretion of NBE and subject to compliance of eligibility criteria prescribed. (i) The theory exam comprises of four papers, maximum marks 100 each; (ii) there are 10 short notes of 10 marks each, in each of the papers; the number of short notes and their respective marks weightage may vary in some subjects/some papers; (iii) maximum time permitted is 3 hours. (vi) Second & Third attempt in Practical Exam shall be permitted out of the next three sessions of practical exams placed along with the next three successive theory exam sessions; after payment of full exam fees as may be prescribed by NBE; (vii) Assentation from Practical Exam is counted as an attempt. Candidates are advised to carefully go through the Information Bulletin before filling the online application form. Candidate will be able to print the hard copy of online application form on successful completion of online application form. While filling the online application form please note that all the fields marked “*” are mandatory.